We pride our-self on providing a highly efficient and innovative vending service from install to technical backup. Every machine installation project we undertake starts with a thorough consultation. After getting to know you and your business, we will offer our expert guidance not just concerning the type of machine you should install, but also the sort of products you should use to fill it. 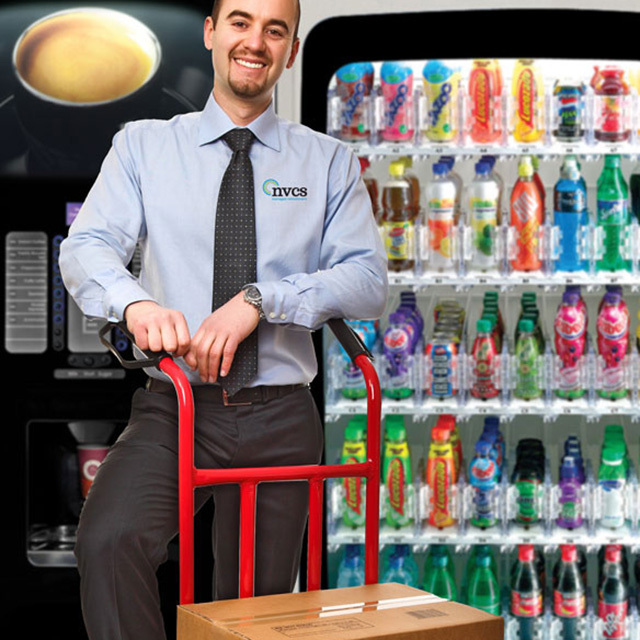 As distributors for all the major manufacturers, NVCS is able to sell, lease and rent a wide range of vending machines. Including CMS, Coffetek, Azkoyen, Westomatic, Evoca, Jofemar, Kenco, Flavia, Bravilor, Fracino, Brasilia, HLF, WMF. Our machines can be installed just about anywhere where there’s enough room, an electric socket and optionally a water supply. We can perform a site survey to advise on the most suitable location. Some beverage machines have a water tank and may be hand filled, others may be filled using a water pump. However the majority of vending machines for ease of use are connected by a flexible hose to a 15mm insolating valve/stop-tap, positioned within ½ metre of the intended machine position. It depends on the machine but all machines will need electricity to power any illuminated signage / screens, refrigerate cold products and heat up water for hot drinks. Modern vending machines are very environmentally sound and don’t consume anything like as much energy as they used to, inbuilt features such as low energy LED lighting, movement sensors and timers all help to reduce operations when the machine is not in use. Can you supply elsewhere in the UK? As members of the Cover Group of Independent Vending Operators, we are able to offer a nation-wide service, should your requirements extend beyond the East Anglia Region. What machine payment options are there? Your vending machine (according to type & manufacturer) may be fitted with a change coin giving mechanism, coin acceptor (exact money only) or cashless key/card readers and the latest biometric readers. This technology is now starting to be used in “cashless systems” across schools, which scan the pupil’s thumbprint eliminating the need to carry cash. Can I have custom branding on my machine? Most machine manufacturers offer a choice of colours or they may be personalised with your company logo or branding graphics. If you are looking to site the machines together in a public area then we can provide a bespoke housing unit to surround the machines. If you are looking to site equipment in a public area, we can help. In conjunction with industry-leading specialists, we can create, build and install eye-catching customer friendly suites whether indoors or out. Please contact us for further details and information. We are happy to provide as much or as little help as you require, be it maintenance, servicing or restocking, you can rest assured that our skilled route operators will be up to the task. Our operators always carry sufficient products to re-fill stock, and carry appropriate parts to ensure your machines are in constant operation. Can you look after the vending machines? NVCS employ fully trained and uniformed staff who carry out the operation of machines for companies who do not have the staff available to carry out the purchasing of stock or the filling, cleaning, cash collection, counting and banking functions that are required. Each staff member is in constant mobile contact with both each other and their operational head quarters. This is done through advanced digital telemetry systems and state of the art vehicle management. This ensures all support staff have accurate information at their fingertips detailing every installation and its current status. All cash collected is returned to head office where it is machine counted and a full audit of monthly vends and monies are undertaken in preparation for monthly invoicing for the customer. Can we maintain the vending equipment in house? Yes, should you choose to maintain your equipment in house, then we also offer a full training package for your designed support personnel, which is accredited by the Automatic Vending Association. We will provide a list of people within NVCS from accounts through to service and you will be assigned your own Account Manager & Telesales contact to ensure a consistent and seamless service. Providing good quality technical service to customers is a very high priority at NVCS Ltd.
We only use our own directly employed service personal to repair and maintain vending and coffee machines. All our service engineers are fully trained to a very high standard and are familiar with our complete equipment range. We work closely with our machine manufacturers to ensure our technical staff are fully up to date with the latest diagnostic and fault finding techniques. Our engineers carry many common spare parts to enable them to complete a high first time fix rate. Our aim is to get our customers machine up and running again as quickly as possible with the minimum of fuss and disruption. In most cases we can respond to service call outs within 4 hours of the fault being reported. The ability to provide a prompt and efficient engineering service to our customers has always been a priority at NVCS. All our vending equipment is covered by our own directly employed service personnel, who are dedicated directly to the equipment we supply. Our engineers are trained, to a very high standard; by the manufacturers of the vending machines that we provide and we offer a very rapid response to service call outs, usually within 4 hours.